This promising young racer moved in late 2014 with his family from Connecticut (where he’d enjoyed a successful career in karting) to Mooresville, NC – a premier racing center – when Neal was just 13. He won his first three races in the Skip Barber Winter Series and finished second in the championship, later that year advancing to the F1600 Championship Series and dipping his toe into the F2000 series. In 2016, young Verhagen won the F1600 Championship and also the SCCA Northeast Majors Tour, qualifying for National Championship Runoffs where he captured the Formula F title – the youngest driver at age 15 years and 242 days to ever be crowned an SCCA National Champion. That drive earned him the 2016 RRDC Mark Donohue Award, a ride in the Mazda Road to Indy Shootout and a seat on the 2017 Red Bull Junior Team. Driving for MP Motorsports, Verhagen finished 11th in the 2017 Eurocup Formula Renault 2.0 series, scoring one podium at the Hungaroring. 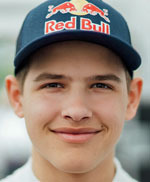 Verhagen is now in his second season with Red Bull and the Renault series. Watch this space.